Save for a few brash exceptions, the Violin has always been an incredibly dignified and beautiful instrument. Its refined, polished wood grains and subtle, expressive curves invoke the same emotions as the soaring leads for which the instrument is known. To the average classical music enthusiast, a Stradivarius is beauty incarnate; a shape that cannot be bettered or improved. But! What if you’re trying to convey different emotions to a different sort of audience? What if, for example, you’ve been summoned to perform Tchaikovsky’s Concerto No. 1 for King Koopa’s Royal Court? 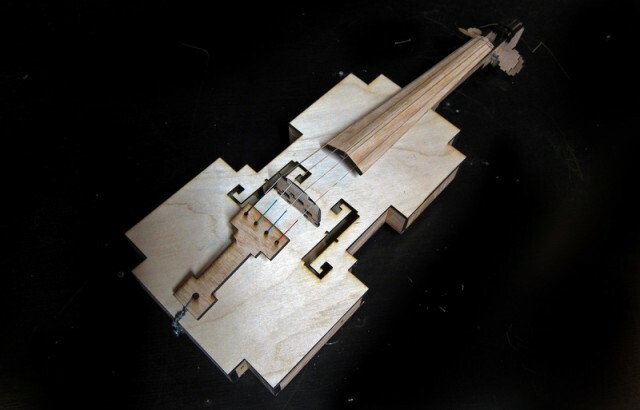 Thankfully, Ranjit Bhatnagar has designed and built a violin that wouldn’t look out of place in the Mushroom Kingdom. The fully functional (and frankly gorgeous) instrument is made from laser-cut plywood, wood glue, and… right angles. Its tuning keys are even square pegs in round holes. How much more 8-bit can you get? The instrument was designed as part of Bhatnagar’s Instrument-A-Day initiative, wherein he was duty-bound to build one musical apparatus a day, every day, for the entire month of February. All of his creations are fascinating examples of ingenuity and craftsmanship, but the 8-Bit Violin is far-and-away our favorite. Hit the Source for a video of this pixelated polyphony producer in action, and click the Instructions link below for instructions on how to make your very own.